What kinds of photography sessions can use photography gift registries? Gift registries aren’t just for wedding photographers. You can use them with newborns, for kids birthdays, seniors as a graduation gift, and even boudoir (as bachelorette party gifts). Anytime a person has an excuse to get gifts, you can create a gift registry, so get creative with your offerings. This is an absolutely perfect time to mention that you have a gift registry that people can use for free to help them pay for their photography. It could be a Christmas gift for their family or help them get the album they really want for their wedding day. It is the perfect way to help people get the photography they really want, so don’t be afraid to promote it. They’ll be thankful you offer them a way to afford the services you provide. How do you get your clients to use photography gift registries? First, you have to tell them you have a gift registry. If they don’t know you have it, they won’t know to use it. This could be a selling point for you, so make sure to mention it when they inquire, and remind them again later after they book. For weddings where couples have already lived on their own for awhile and have all the home things they need, a photography gift registry that allows them to get a nicer album and some beautiful wall prints is a great option that many will use and appreciate. Second, you want to make sure that your registry gives them exactly what they want and is easy to customize. For example, they should be able to pick the items they really want to have instead of just listing everything you offer. The more you can customize it to their needs and make it work like gift registries at other businesses work, the more likely they’ll be to use it and tell everyone about it. One of the most simple and powerful ways to get more sales is simply by suggesting items for their registry. For example, for newborn clients you might suggest that they add a “baby’s first year” plan, an album, a large wall print or canvas cluster, and baby announcements to their gift registry. By giving them a “suggested gift registry” they are more likely to actually put those items into their gift registries for people to buy for htem. Also, encourage them to dream and put anything they’d really like on it, even if they may not have purchased it otherwise. Not only does it increase sales for you, it increases desire for the items they add and makes them more likely to potentially purchase them in the future even if they don’t receive them as a gift. Make sure that it is as easy as possible to share with other people. Giving them easy ways to share it on social media nad via email is a great way for them to make sure people see it. You might also consider offering them business cards with a link to their registry on it from a past session that they’ve done with you to hand out to friends and family, or to send in invitations. One of the most important part of maximizing sales is to make sure that it’s simple to use! If it is difficult or confusing, people will simply get something else. Finally, making sure it matches your branding and looks professional is important for helping get more exposure to your business and attracting new clients. What software is best for photography gift registries? While there are some built-in photography gift registries in a number of online galleries, I’ve found that they aren’t very intuitive and didn’t convert effectively because they were confusing or weren’t easy to set up. But there’s a new photography gift registry program out there called Ciderr that is set up for maximum effectiveness. I was given free access to the software and it’s unbelievable. You can custom brand it to match your business, you can allow clients to pick exactly which products they want on their registry, and it’s created to be shared virally on social media accounts and via email. It’s everything I’d want in a photography gift registry. The bad news? It isn’t open to the public yet. Exclusive Access for The Modern Tog readers! The good news? They gave me a special link that can get you in now before it’s open to the public. First, check out how awesome it is by clicking here. Then, if you like it as much as I do, you can buy 3 months worth of access plus get a few marketing bonuses (such as Save the Date templates, “Registered With” templates to help clients spread the word, and some tracking tools to see what is working and what isn’t) by clicking here and purchasing their Marketing Toolkit. It’s a great way to test it and see how much money it’s really worth before committing to a larger amount of time with it. 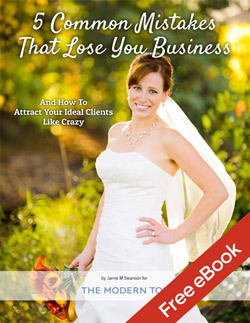 I highly recommend it, as it will help set yourself apart from your competition and is a great selling point. This is an exclusive link that will give you access before other people without an invitation, so make sure you use that second link to buy it. It’s not cheap, but the increase in sales will easily make it worth every penny and make you far more than if you weren’t using it at all. It will easily pay for itself if you use it with even just one client per month. People will be spending tons of money on gifts for your clients, so why not encourage them to spend it with you? The only *real* bad part? Right now it’s only available for businesses based in the USA. Sorry to all my international readers. But they hope to expand to other countries, so sign up for their newsletter to find out as soon as that’s available. Click here to learn more or to try it now. And thanks for using this link – it helps support the time it takes to run The Modern Tog, so I appreciate it greatly!